There is something to be said about retro consoles and games. While this sector has made leaps and bounds, and consumers are demanding more (graphics, game play, etc. ), a trip back to the past is always a welcome change every now and then. Ion – that manufacturer responsible for “high tech turntables” – has come up with a new dock that will satisfy the nostalgic feelings of every gamer out there. The dock is meant for the iPad and will turn this ultramodern gadget into a console reminiscent of the past. It will allow you to play Atari’s Asteroids and even give you realistic buttons and knobs. 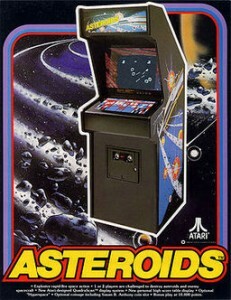 Just to refresh your memory, Asteroids was released as a video arcade game in 1979. The two dimensional game has a simple premise that it easily caught on and soon became the best selling game of all time. The idea is that the player controls a spaceship that flies through fields of asteroids. Flying saucers also come into the screen. The player has to shoot at the asteroids and flying saucers with the aim of destroying them without crashing into them. Drooling now? Watch the demo video below, and I am sure that you will be wanting the dock for your iPad.